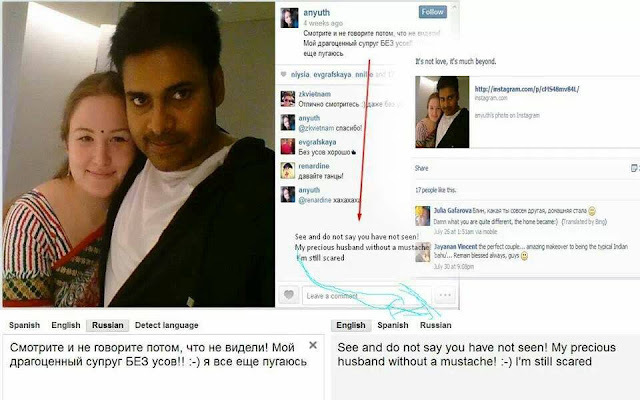 Home cinema Is She Really Pawan Kalyan's New Wife? Is She Really Pawan Kalyan's New Wife? Pawan Kalyan has been hot topic in Tollywood and now he has become a hotter topic. Gossip mills have been busy cooking rumors about Pawan Kalyan's alleged relationship with a foreign girl after divorcing Renu Desai. Now a pic has been making rounds in social networking sites. The picture appears to be very convincing but there are suspicions if it was a morphed one. A Russian print screen file of twitter and facebook was uploaded by someone on social networking sites in which the Russian line was translated into English as "My precious husband without mustache". But when tried to find the authenticity by tracking the original conversation, nothing was proved to be true. The names mentioned in the twitter conversation were of Spanish origin but in print screen page it was in Russian. Some sites have tried to give the original pic but the man's face in declared original pic was appearing to be morphed one as Pawan Kalyan's pic is more convincing. However, doubts have been mushrooming on the authenticity of this picture. Well if it's not proved, nothing happens to Pawanism. Otherwise, Pawanism will be clouded by womenism.